First words and first steps are typically mastered at about the same time. The period from one to two years is often very enjoyable for parents, as they watch their babies become walking, talking bundles of fun. Language development really accelerates during the second year, with little ones constantly adding new words to their vocabularies and learning a bit about sentence structure and storytelling. For parents, the second year of their babies' lives brings many proud and funny moments. While there is no set "right" time for toddlers to develop their language skills, the second year of life brings definite advancements. This is also a year of great social development for kids, with language skills aiding their socialisation and vice versa. Individual children will most likely reach some of the milestones described here a bit ahead or behind the listed timeframes, which is perfectly normal. Parents who are concerned about their child's language development should schedule a consultation with a speech-language pathologist. By fifteen months, most children have a vocabulary of four to six words. While their ability to verbalise is still limited, their capacity to understand is great. Vocabulary comprehension is much greater than it was just a few short months ago, with toddlers being quite capable of understanding simple directions. Parents should continue reading to their toddlers, who may decide that they have a favourite book or two that they request over and over. Picture books make especially good choices now, offering little ones to show off their knowledge by pointing to objects as they are mentioned. At a year and a half, kids typically have ten or more words at their disposal. 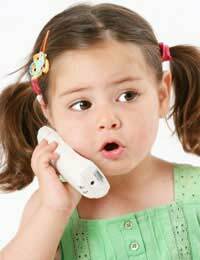 Toddlers are happy little mimics, attempting to repeat the words that they hear (watch out! ), so it's important for parents and carers to talk to little ones every day. Choosing descriptive speech can help toddlers to not only increase their vocabularies, but to begin learning their colours and shapes, as well. Rather than simply handing a child a toy, parents should pointedly describe it as they pass it to their little one. "Would you like to play with the big green truck?" The last few months of the second year are important in terms of language development, with new words being added every day. By the second birthday, most kids are able to say several hundred words, though they may tend to repeat their favourite phrases frequently ("Cookie, please!"). Simple two and three word sentences are common, used mostly to make requests ("Go car now.") or to express their growing opinions ("No sleepy."). Most two year olds will tell you their names when asked and can identify family members by name. This age range typically sees toddlers asserting their independence and this newfound sense of power shows up in their language development. Parents should be prepared to hear "No!" from their newly-turned-two year old on a regular basis! As parents get ready to celebrate their children's second birthdays, they may look back with amazement at just how far their little ones have come in just two short years. While there will certainly still be moments of quiet cuddling, most kids this age are bubbling with energy and have a lot to say and do. Remember when you couldn't wait for your child to walk and talk? !